October 29th marked the two-year anniversary of Hurricane Sandy, which resulted in 182 lives lost, 150,000 homes destroyed, and 17 percent of the city’s land flooded. Sandy caused over $65 billion in damages across the tri-state area, many of which have yet to be repaired. While some measures have been deployed, other substantial long-term measures are still in development or are awaiting implementation. These include flood protection in Red Hook and dunes and other coastal protections in Breezy Point, among others. Much of the devastation from Sandy occurred in low-income neighborhoods,and some have not fully recovered. The chaos of the aftermath of Hurricane Sandy, and the slow rebuilding of affected neighborhoods, points to the wealth inequality inherent in New York City’s housing landscape. The economic division in New York City is starker than it has ever been. With 21 percent of city residents living in poverty and the median annual household income decreasing by $821 from 2010 levels, those living in poverty are still experiencing worsened conditions following the recession. At the same time, the median annual income for the highest fifth of earners has risen $1,919 to $223,285. For individuals whose homes were damaged by Hurricane Sandy, New York City’s Build It Back program provides options for rebuilding and repairs. Eligibility requirements can be found here. This program has aided many New Yorkers: as of October 27, 2014, 757 construction projects have started, 158 homes have been fully repaired, and 1,020 reimbursement checks have been delivered. Additionally, Project HOPE offers individual and group counseling, public education, and assessments and referrals for those who experienced trauma resulting from Hurricane Sandy. Their 24/7 crisis hotline, 1-800-LIFENET, offers free and confidential mental health and substance abuse information. The Department of Consumer Affairs also created a list of resources ranging from replacing missing documents to mental health services and assistance with food and transportation for affected New Yorkers. Courtesy of McSilver Institute of Poverty Policy and Research who has kindly given SJS permission to syndicate this piece. 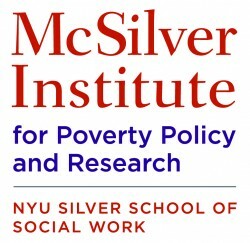 Disclaimer: The views and opinions expressed in the Policy News Briefs are not necessarily the views of the McSilver Institute for Poverty Policy and Research or NYU’s Silver School of Social Work. If you have comments or suggestions about this service, contact us at info@mcsilver.org.